One Day Ground Shipping to Ashburn, Virginia! $39.99 & FREE Shipping on orders over $59. Delivers to ( change ) by as part of our Fast & Free Shipping. 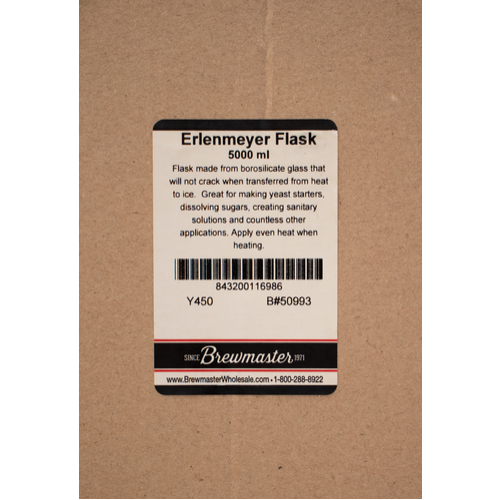 This Erlenmyer flask is huge, coming in at 5000 ml (5L! ), making it the ideal vessel to make a large yeast starter for a 10+ gallon batch. The best brewers make large yeast starters to get their beer fermenting fast, and most of them do so in an Erlenmeyer flask. Large populations of active yeast help ensure flavorful beer free of off flavors. Because this flask is made from borosilicate glass you can move it from a boil into a cold water bath for cooling. This means you can do the whole process in one container, keeping it simple and helping to reduce the risk of contamination when transferring from one container to another. It is important for your safety to heat water in the flask with a heat source that distributes heat evenly. Morebeer! recommends using the "double boiler method." This process involves using a boiling water bath on the outside of the flask to heat up the water inside the flask. All you need is a kettle 3 gallons or larger. This process is much safer and efficient. If the flask should break or boil over, your kettle will be there to collect the contents, thus keeping your stove clean and keeping you safe. Safety First: Please take us up on a great deal - save $14.95 when you purchase a 5000ml flask and our BE300 5 gallon stainless steel kettle at the same time. Use Promo code SAFETY1 at checkout. We build starters for 3 main reasons. First, to ensure yeast health. By making a starter 1-3 days in advance, you ensure that your yeast is healthy and strong and ready to do its job. Second, to create more yeast. By making the starter you will increase the cell count of the yeast, giving you a better chance of keeping bacteria's and wild yeasts from fermenting your wort. Third, if you are making high gravity beers. If you are making a high gravity beer (1.060+) you will need more yeast to start the ferment faster. High gravity beers will also finish more completely when you pitch ample quantities of yeast. In the lab world, these flasks are known as "Student Grade". Student grade flasks may have small scratches and air bubbles. A great flask for making yeast starters! Large lager starters, and to be able to over build ale starters to save money on yeast. I want to make a yeast starter with plenty of air space. I had one that worked great, but knocked it off a high shelf. This time I'm getting two! To make larger starters for 10 gal batches. To step up starters for high gravity beer. Need to make big starters. Need to make my yeast stronger! I will use this to make yeast starters for 10 gal. batches. I needed a flask for larger starters. 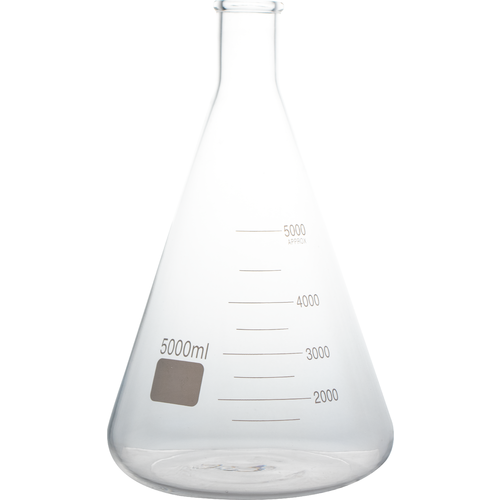 What is the diameter of the bottom of this 5000 mL erlenmeyer flask? The flat part of the bottom is 6.5 inches in diameter. The widest dimension is 8.75 inches. 9" on the last flask I recieved. The flasks have varied slightly in size, mostly the top opening. I haven't measured directly but I thought mine was much wider - closer to 12" overall. What size (replacement) foam stopper does this need? 11 1/2? Where do I get this? BEST ANSWER: Hi Thomas - The #12 foam stopper should work perfectly with the item. Unfortunately, we do not have a specific recommendation for the purchase but a quick google search should bring satisfactory results. Not really a direct answer, but for starters I just use a piece of aluminum foil over the top of the flask, which I spray with some Star San for good measure. Haven't had any issues using it stove top (electric). Recommended! This is the largest flask I have ever seen! I filled it up to the 2L mark for my starter. Works on a stir plate and I'm not sure why so many people complained about the bottom. Mine starter stirred just fine. They pack this thing so well it's probably rare that it gets broken upon arrival. Thank you so much for your feedback. We really appreciate the honesty and value great feedback like this as it helps us improve our products. Cheers! Great flask for the price. Great flask for the price. I had a little trouble getting the stir bar to stay put. Ended up putting a plastic dinner plate on the stir plate; the increased height and/or extra plastic calmed things down. Made a healthy whirpool from 2L up to 4L, no problem, using 2in bar. Everyone who brews 10+ gallon batches should own a 5L flask unless they want to buy a ton of yeast for each batch. I do not boil directly in mine. I recommend using it with a foam stopper for gas exchange and a couple drops of Fermcap to keep rowdy yeast in check. The bottom glass is slightly uneven so it can be finicky to get my stir bar going smoothly but that's to be expected with glassware of this grade. No complaints. Excellent quality great price. However not wide mouth, makes pouring wort/yeast into it difficult. Flat bottom, works great for spinning magnets. Would recommend this product. 5000ml Erlenmeyer flask. Good thick glass, perfect for my needs. Good quality glass! Makes an excellent starter! 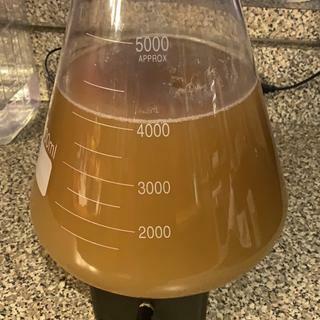 The flask worked great for a 2.5L starter for a lager.The bottom is nice and flat so there were no problems with the stir bar on my stir plate. It is advertised as Borosilicate and able to withstand going from very hot to cold but it does not have any markings, such as Pyrex. I tried the double boiler method as mentioned in the info but after 30+ minutes the wort was not boiling so I emptied the wort into a kettle, boiled, then into the sanitized flask. Good 5L flask with a flat bottom. Great 5L flask. This one has a very flat bottom so it still works with smaller stir plates such as the stir starter (what I have). No issues with my stir plate. Stir bar holds tight in center of this flask at all speeds even though the bottom is slightly concave. A high quality stir plate with strong magnets may over come the drawback of a concave bottom. The graduation markings are "approximate." This isn't an issue for me because I use measuring vessels that are more accurate as a work around. This flask is priced appropriately for what you get, which is why I purchased it. My equipment was able to overcome the slight flaws easily, which made this flask usable for me and a bargain. Great quality. Got it at a great price! Love it! This thing makes large yeast starters so much easier than my old 2L flask. No more worrying about waking up to a mess. It's also great to boil directly on the stove and chill directly in the sink, less chance for contamination. My current stir plate is struggling to keep up, although that's because it was made for 2L flasks. I really like the size of this flask. It makes a very good starter for my wine making. Are use a stir plate when using this and everything went very well. I use this flask to make > 2 liter yeast starters for beer brewing. It works as intended. I was pleasantly surprised that the glass is relatively thick compared to other Erlenmeyer flask I have used. Works as intended. It did have some small scratches and scuffs but It doesn't effect the product. Very high quality flask! Much thicker glass than most 5000ml flasks I have used and broke!! I also purchased 2 of the 3000ml flasks from MoreBeer and they are the same high quality thick units! Got it quick! Really needed a bigger flask for bigger brews. Read a lot about people saying the stir bar wouldn't stay, so I immediately filled it with water and I have no problems with mine. Great looking flask and I'll have a starter in it this weekend! Well built, nice flask but one major issue with the one I received: the magnetic stir bar will not, even at low revs, hold in the center. I use a 2" bar in a flask this size as the 1" does not have enough "juice" and it keeps getting thrown to the side. I tried several different bars and even the smaller one to see if I could get it to hold but to no avail. I put 3000 ml of water in the flask so I could hopefully see the problem and I think the bottom is crowned or convex so the magnet tends to drift to the side, thus causing the problem. Oh well, back to shopping for another flask. The bottom of the flask is concave and not flat. This prevents a stir bar from staying put, essentially getting thrown to the edges of the flask at all but the lowest speeds. Therefore it is essentially useless for its intended purpose. I can still make a 2L starter in this flask, but when I need a bigger starter for a larger batch or for a lager, I'm glad I can make it in one flask. The easiest and safest way to make a starter is with borosilicate glass. I have 2 of these 5L flasks because 1 just wasn't enough. Have been using this for Belgian starters and bigger batches. It just works great, even with a smaller pill and stir plate. Great value and quality product. The perfect size flask for 10 gallon to 20 gallon batches! This flask has been in regular use since I got it. It blows away the 2L flask I had purchased previously. For proper starters, I have been told you need a vessel 3-4 times the volume of your starter for best results. that is nearly impossible in a 2L, but no problems with this 5L flask. Love my flasks. If you make starters buy some. They make the process a breeze. Good Flask. Better than I was expecting after reading some reviews. I am more than happy with this flask. In one of the reviews it says the stir bar won't stay in the middle and shoots off the side. I as well had an issue with this, but all i had to do is start out with my stir plate on the lowest setting and slowly turn it up all the way and it had no issues at all. I have made 2-3 5L starters with it now and heated it on the stove and cooled it in the ice bath as well. I have had no issues whatsoever. Works great. As the summary states. The domed bottom on mine throws the stir stick into the side of the flask. These maybe part of the imperfections talked about in the description, but it's a very annoying defect. If you're a gambler this price can't be beat, but be warned, you might have to try on a few before you get the right one. Don't believe the volume marks! I like the size but I noticed that the volume markings were off when I started filling my Braumeister 50L (did not line up with volume markings on the BM center pole). It turns out all the markings on 5L flask are about 300ml high! I would have expected somewhere about +/- 50ml but not 300ml! I guess this must my slight defect that MoreBeer mentions about in the description. Bottom line - verify your volume markings! The bottom of this flask is not even remotely flat, meaning it's extremely difficult to use on a stir plate. I can't tell you how much time and effort is required to get it going, only to have the magnet fly off for seemingly no reason at all. Basically, the domed bottom elevates the magnet about 3/8ths of an inch above the stir plate, reducing its effectiveness. Super frustrating, I strongly suggest you find another flask with an flat bottom. You'll forget the added cost and enjoy easy to make starters. This is a quality flask for a great price. If you're making a 2 liter (or larger) starter, this flask is a necessity. The lager volume keeps vigorous starters in the flask where it belongs--instead of all over your counter. Nice size for step up starters. Good quality, nice to step up starters for lagers etc. Packaged extremely well, as the carrier was not nice to the package, and the flask arrived unbroken. this is for the BIG starters!!! Super quality! I use it for starters. Great quality at the best price ANYWHERE. It is pyrex. Can boil with it. Pyrex is not indestructible, do not rapidly cool. Great for making a starter for larger batches (2 to 3 liter starters for 12 gallons of wort). No issues with the transfer of boiling wort from gas range and ice water. I had to get a larger stir plate to handle the thicker glass on the bottom. I use this for 10 gal batches and when brewing lagers. A little large to find a place to store but a much needed item to have. Wonderful solid flask that has really expanded my ability for making yeast starters without potential messes of the yeast climbing out of my smaller flask! Great value! Have had no problems with temperature shock. 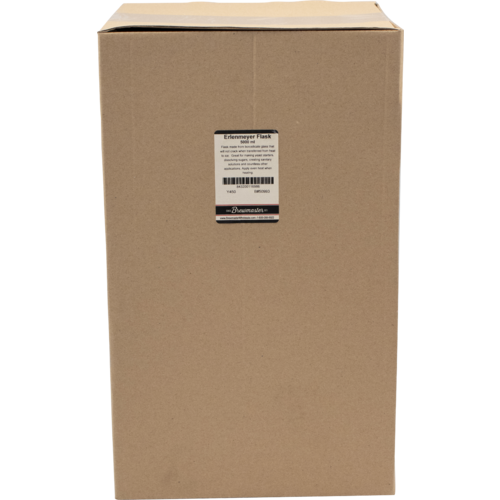 Fantastic size to make starters for lagers, 10 gallon batches, or very high gravity beers! I've made two starters with this guy since purchasing. Both have been 10 gallon batches which I used to under pitch due to not having a big enough starter flask. Both batches started bubbling within about 2-3 hours instead of 6-8. The size of this thing makes it difficult to find a good, safe place to store it so I took the advice of another reviewer and saved the box and bubble wrap it came in. I use this to step up starters for high gravity 10G and lager batches. This flask is huge. The 5000ml mark isn't even up to to the neck, so it's probably a lot larger than you'd expect. You definitely get your moneys worth out of the size-factor. The picture on this site does not do it justice. If you look at the picture they have displayed, the 5000ml mark is that one that is slightly above the middle of the image. It's not that one at the very top near the neck. I know a lot of people are probably reading the reviews and trying to figure out what size of stir bar to buy. Obviously it will depend on your stir plate and the stir bar, but I tested it out with water using both a 1" round pill-shaped stir bar without a center ring and a 2" round pill-shaped stir bar without a center ring. I found that using the 2" stir bar I would have to spin at a lower RPM to keep it from throwing, which did not produce a good vortex. When using a 1" stir bar at higher RPM I got a good vortex and did not have to worry about throwing the bar. If you are unsure which bar to buy, I would highly recommend a standard 1" bar. This thing can get pretty heavy with the weight of a 5000ml starter. I just wanted to point that out so if you're trying to move around a hot flask of wort to an ice bath that you prepare in advance. This thing is high quality. Dwarf's my 200.